The coordination chemistry of copper(I) carbonyls and cyano complexes is reviewed. Primary attention is focused structural chemistry, including coordination behavior, bridging modes, network formation, flexible coordination number, and reversible ligand binding. Additional coverage of infrared spectroscopy and orbital interactions in carbonyl and cyanide bonding, and photophysical behavior of metal cyano complexes is also included. 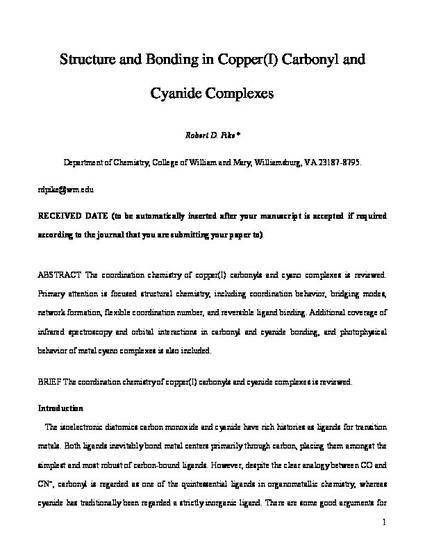 This document is the unedited author's version of a Submitted Work that was subsequently accepted for publication in Organometallics, copyright © American Chemical Society after peer review. To access the final edited and published work see https://pubs.acs.org/doi/ipdf/10.1021/om3004459.